Do you have a tv show that you just loved as a kid? For us Mighty Morphin Power Rangers is one of those shows. So imagine our excitement when it was announced that there would be a Power Rangers movie reboot! Figuring out a recipe was a little bit tougher than normal. We didn’t want to rely soley on the colors for the theming but also wanted to include them. Then it came to us! 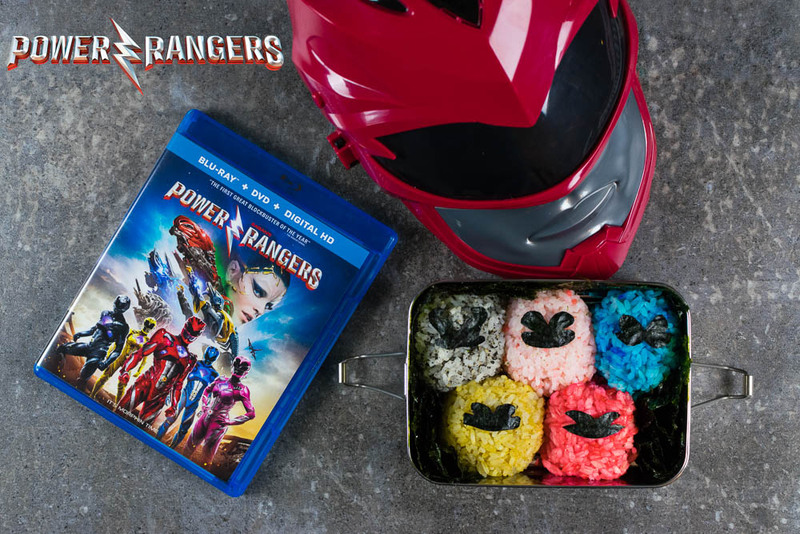 Power Rangers Onigiri! “Power Rangers follows five ordinary high school kids who must become something extraordinary when they learn that their small town of Angel Grove – and the world – is on the verge of being obliterated by an alien threat. Chosen by destiny, the unlikely group of teenage heroes are the only ones who can save the planet but first, they have to band together in order to harness their super powers and become Power Rangers.” Power Rangers does a great job of bridging the generation gap between Mighty Morhpin Power Rangers and now. Fans of the show and new fans alike will enjoy this movie. 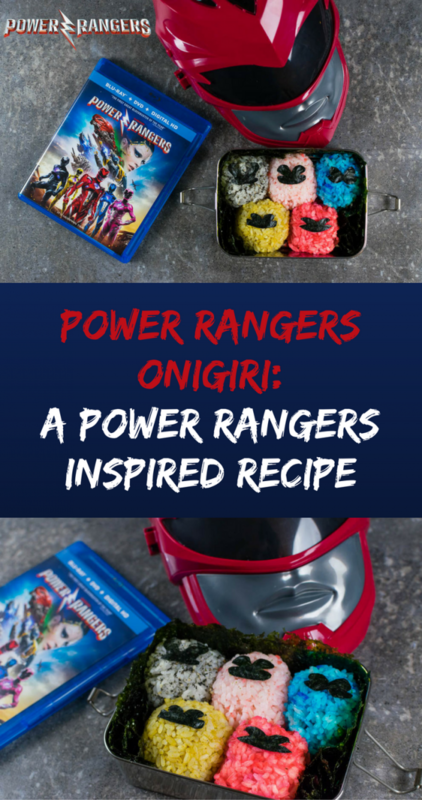 The inspiration for our recipe came from Power Rangers origins. The movie is based off of the American television show The Mighty Morphin Power Rangers. However, the origins go even further back to the Japanese tokusatsu Super Sentai. Knowing this, we decided to pay tribute to the Japanese roots of the series. 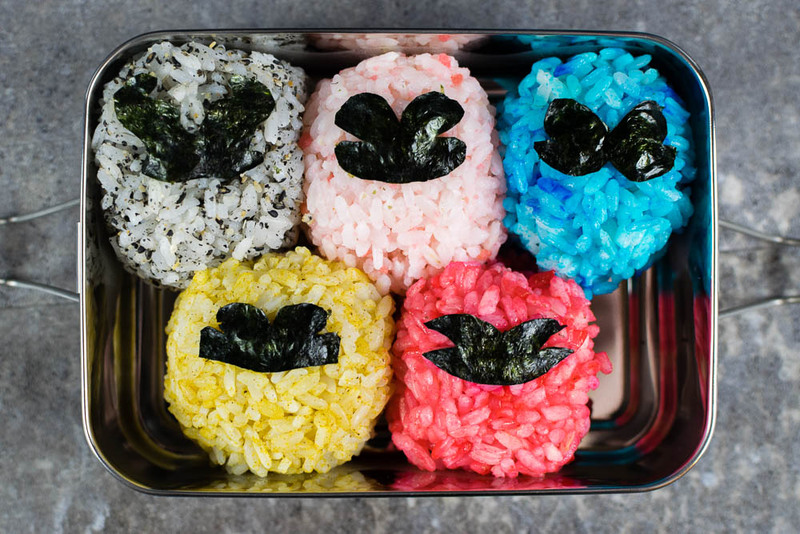 To do this we decided to create a bento box with onigiri! What better way to combine the origins and visuals of the film? Have you tried making onigiri? We’d love to see pics! Use the hashtag #GeekEats or share your link below! For Red- We used food coloring but you can also boil your rice in the water from red cabbage with a little bit of vinegar. For Blue- We used food coloring but you can also boil your rice in tea made from Blue Pea Flowers. For Yellow- We used curry powder. You could also use turmeric or food coloring. For Pink- We used crushed shrimp chips. For Black- We used ground black sesame seeds. Cook rice per package instructions. Dye your rices with the various colors from above. Put a little rice in the palm of your covered hand. Take a small bit of filling and put it on the rice. Cover with a bit more rice. Using the plastic wrap, shape into a helmet shape. Repeat for all 5 Power Rangers. Serve in a bento box. *This is a Paid Promotion for Power Rangers; We were also provided with an advanced copy for research purposes. Images and title treatments were used with permission. All opinions are wholly our own. View our Disclosure Policy for more info.